When salmon fishing the Great Lakes a good cured egg is everything. If you have bait that’s cured right you can fish a piece of skein for 15-20 minutes whereas a poorly cured egg might only last a few drifts. 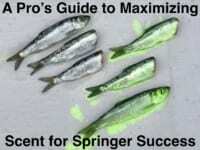 Good bait is going to last longer and you aren’t going to go through as much of it. There’s an endless amount of benefits to fishing with a well-cured egg. On slow days, especially, when you have a lot of guys fishing a good bait stands out and gets bit more. While it changes year to year, the last few years super pink has been the go-to bait. Red works too, but pink has been our mainstay in Northern Michigan. Meanwhile, on the Little Manistee this summer all I could hook fish on was orange cured bags, but that is likely because the water was so low and clear. On the other hand, the Manistee is big on pink and I don’t see that changing this year. 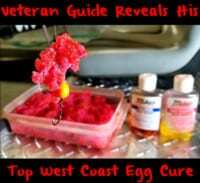 Most guys aren’t here use Fire Cure when curing eggs. For several years, that’s what I did, too. However, late last season and so far this fall I’m mixing two cures. Using two cures on the skein is making a big difference for us. I use the Fire cure on the egg first because it gives the eggs what they need to maintain a good color. Then the BorX O Fire dries it out, makes it tackier and firms up the egg. By utilizing both these processes it holds the egg together better, allows you to fish it longer and maintains vibrant colors longer. Step 1. Start with clean, blood free skeins. You can achieve blood free skeins by bleeding your fish out within minutes of catching it. Step 3: Add Fire Cure. I use a lot of pink, but red is good, too, if targeting kings. Sprinkle an even layer of Fire Cure across the eggs. Be careful to not use too much cure or you’ll burn the eggs. Pour on a layer that allows the entire skein to be exposed to the cure. Step 4: Place eggs in a bag and then into a refrigerator and allow to cure for 8-12 hours. Step 5: After the eggs have cured, place them on a paper towel. Then add a slight sprinkle of BorX o Fire to both sides of the skeins. Step 6: Roll your skeins up in a paper towel, place them in a refrigerator and they’re ready to use. Many anglers wonder what size skein is best when targeting fall kings. It varies, but sometimes I use skein about the size of the golf balls. Other days we use them the size of a 50 cent piece. I usually don’t go any larger than a golf ball, but most of the time we’ll mess around with different sizes until we know what they want on that particular day. Bags can be important too. Some days they want only skein and other days they want the skein in bags. I like to bring bags and skein. In September and October they can get finicky. Early in the day they will hit skein and then later they may only want bags. Experiment. Editor’s Note: Kyle McClelland is one of the founders of XXL Chrome Chasing. For more info please visit http://www.chromechasing.com.